You know, when I finally cracked the code to gluten-free baking and managed a spectacular gluten-free chocolate cake, I was so damn happy about it. I mean no one wants to eat a cake that tastes like it’s not quite as good as the original. You want it to just taste like delicious cake. Same thing for vegan cake of course, you just want it to taste like cake. Not vegan cake. 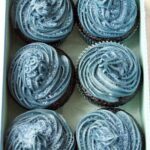 Well, these gluten-free chocolate cupcakes are naturally also vegan (I say naturally because, have you seen the name of this blog?) and really if you feed them to your non-vegan gluten-eating friends they will have no idea. 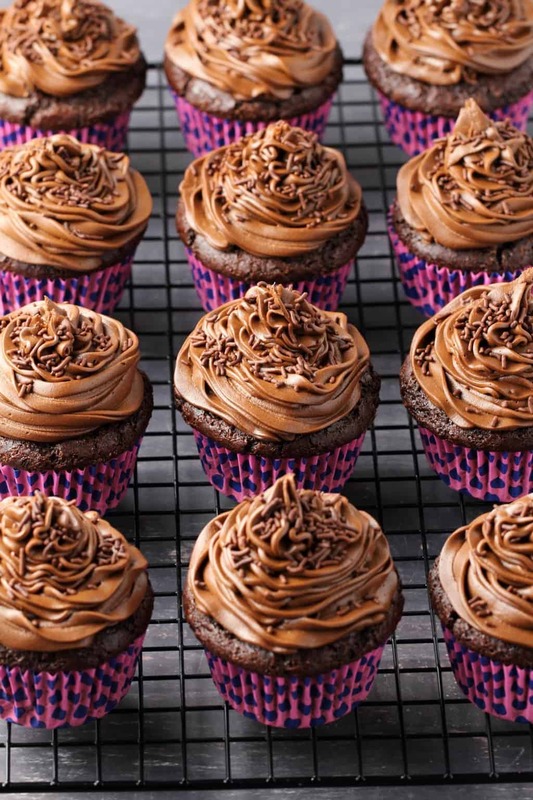 These are just fabulously delicious cupcakes. No one would be the wiser unless you told them. I first baked these for my brother-in-law’s birthday and honestly all 12 were devoured in about 10 seconds. 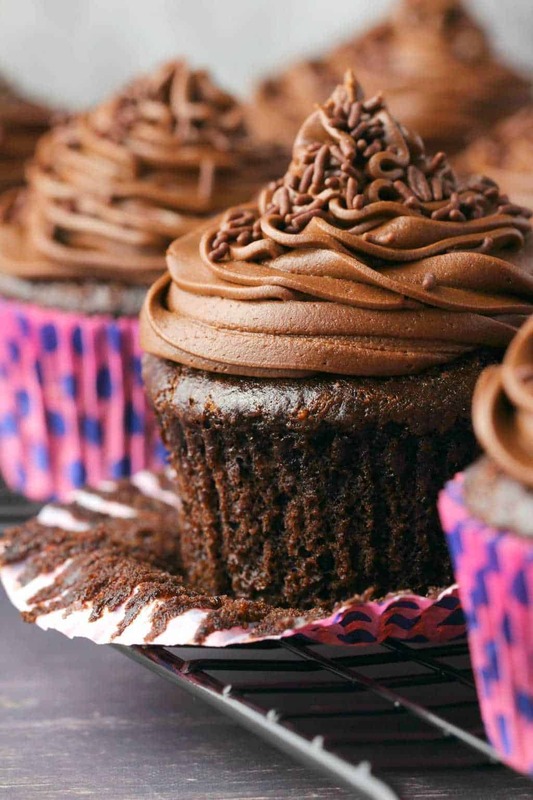 The texture of these cupcakes, oh my, the texture. So perfectly moist and spongey. The taste is so perfectly rich and chocolatey! And really they’re a cinch to make too. 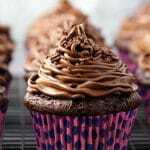 I have since made these gluten-free chocolate cupcakes for a lot of special occasions. 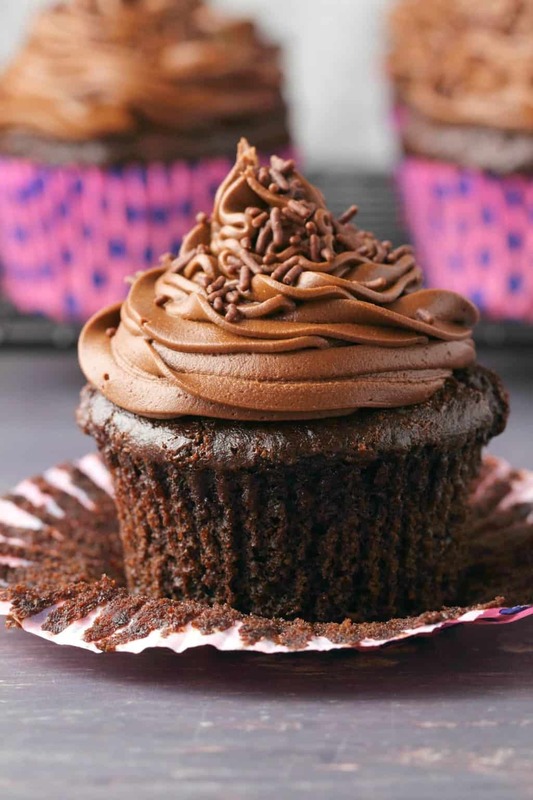 I have a mother and sister who are gluten-free so if they’re coming over for any sort of special occasion, these cupcakes, or the gluten-free chocolate cake recipe that they’re based on, are making an appearance! Always check the expiry date on your gluten-free all purpose flour mix! Gluten-free flours tend to have a shorter shelf life than regular gluten flours, and on one particular occasion, I didn’t check the expiry date on mine and made my mother a gluten-free birthday cake. I then proceeded to be horribly embarrassed (and question ALL my baking skills!) when it tasted bloody awful! Only to find out that my flour had expired (at least it made me feel good again about my baking skills!). So check the dates on your flour, especially if you don’t bake super often, it’s likely you need to get a fresh supply. Best of all? No one will know they are gluten-free. Or vegan for that matter. They’re just like the best cupcakes you’ve ever had. That’s all. 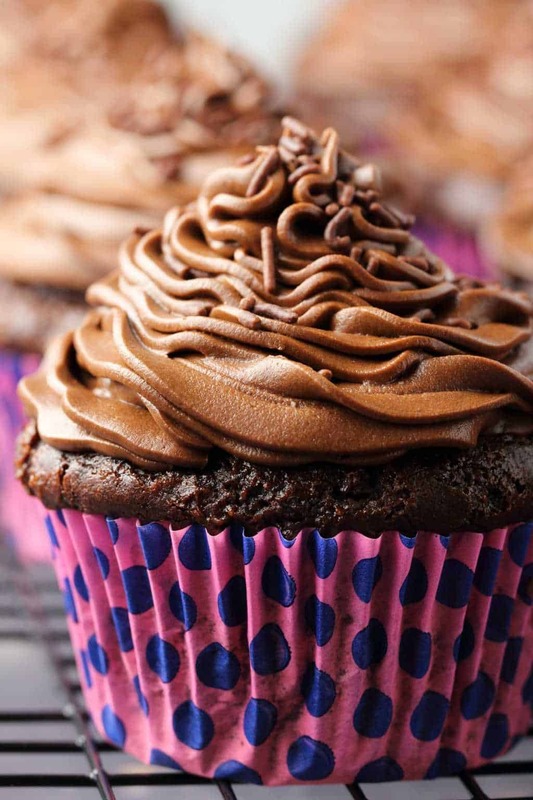 So let me know what you think of these gorgeous gluten-free chocolate cupcakes why dontcha! Any questions, comments, post them down below in the comment section. And please do rate the recipe too! 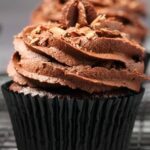 If you’re not completely gluten-free and dabble in a bit of regular gluten baking, then check out our regular vegan chocolate cupcakes recipe. It’s a total winner! I paired it with some mint buttercream frosting but the chocolate buttercream from this recipe is also a perfect match for that recipe, so you can switch that around if you like. 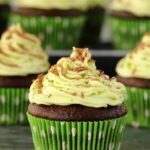 And then check out our gluten-free vegan vanilla cupcakes with matcha green tea frosting if you’d like a delicious vanilla counterpart to this recipe, or our gluten-free carrot cake cupcakes with cashew frosting! While you’re here, sign up to our email list for a fabulous vegan dinner recipes ebook containing 10 great recipes and to stay updated with all our latest recipe postings. 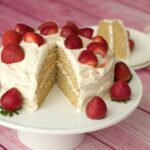 Fair warning, gluten-free cooking and baking is not the focus of this blog, but we definitely still have quite a few recipes that end up being gluten-free anyway, check out our gluten-free recipe section. 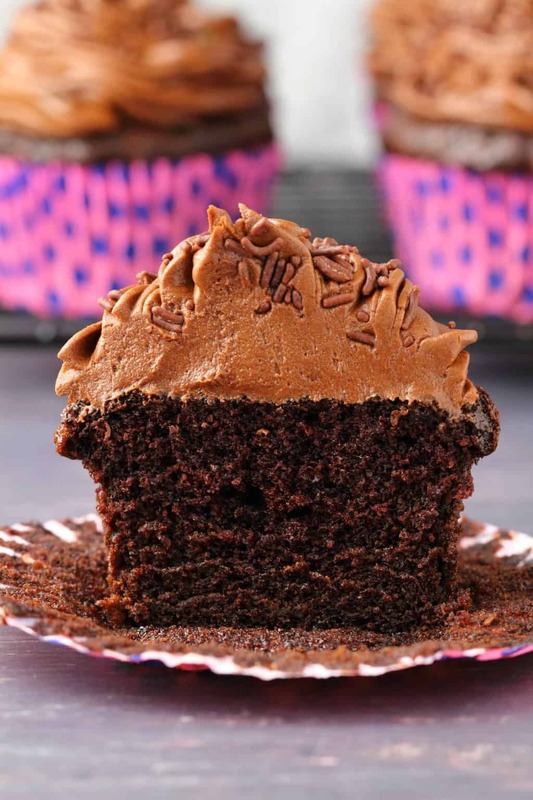 Perfectly moist and spongey gluten-free chocolate cupcakes with rich chocolate buttercream frosting. So good you’ll never know they’re gluten-free and vegan! Add the brown sugar, baking soda and salt and mix together. Prepare your flax egg by mixing 1 Tbsp ground flaxseeds with 3 Tbsp hot water and allowing to sit for a minute. Add the soy milk, vanilla extract, olive oil, applesauce and vinegar and mix in. Lastly add the flax egg and mix together. Use a hand whisk to get rid of any large lumps (very small ones are fine). 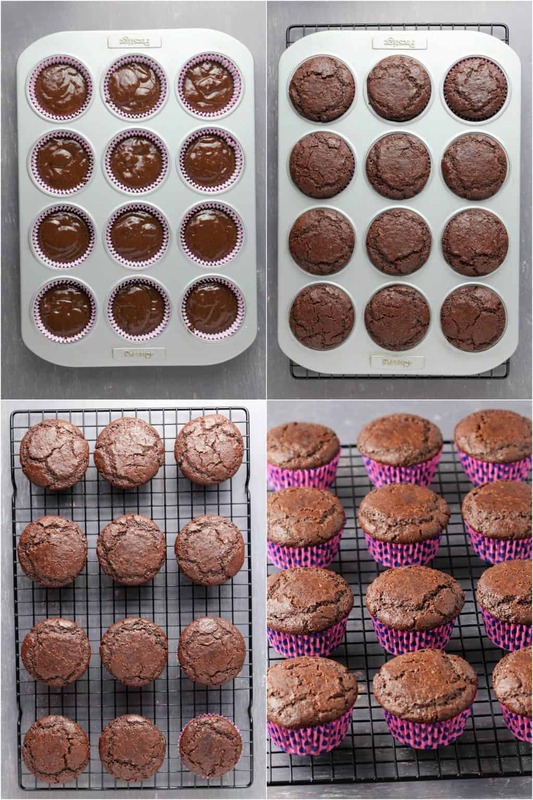 Prepare your cupcake tray by setting cupcake liners into place. 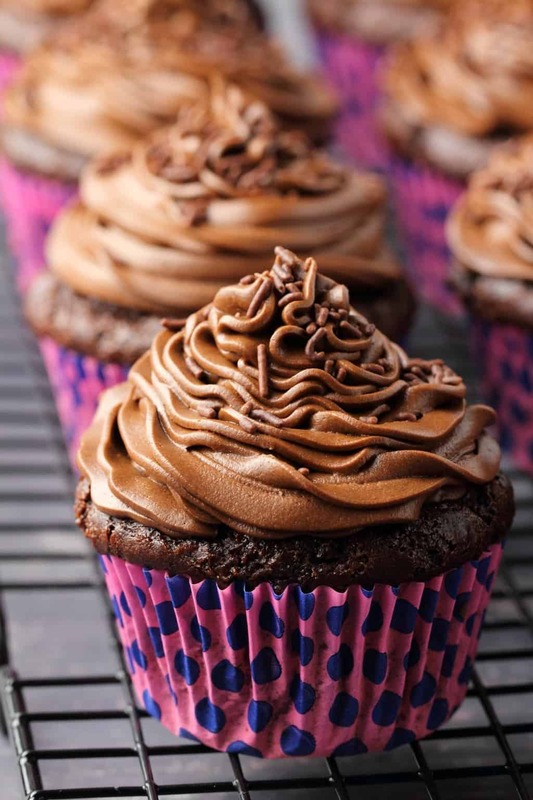 Move the batter to a jug that allows for easy pouring and evenly divide the batter between the 12 cupcake liners. 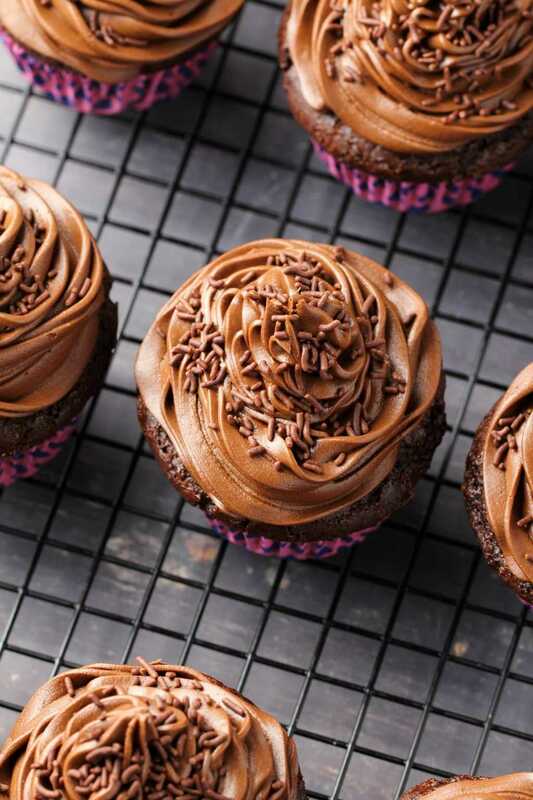 Place into the oven to bake for 22-25 minutes or until a toothpick inserted into the center of a cupcake comes out clean. 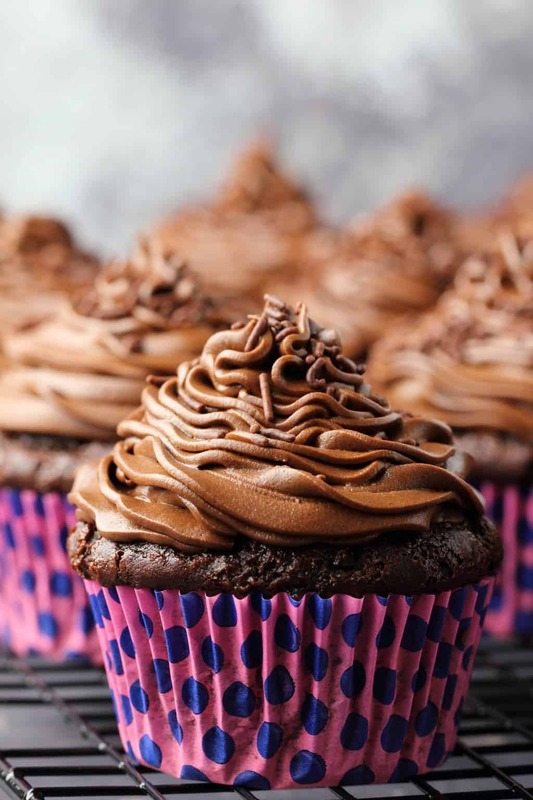 While the cupcakes are baking, prepare your frosting by adding all the ingredients to a mixing bowl and mixing with an electric mixer, starting on low speed and then increasing speed gradually until smooth and creamy. Don’t add all the non-dairy milk at once, gradually add it in, you might not need all of it. 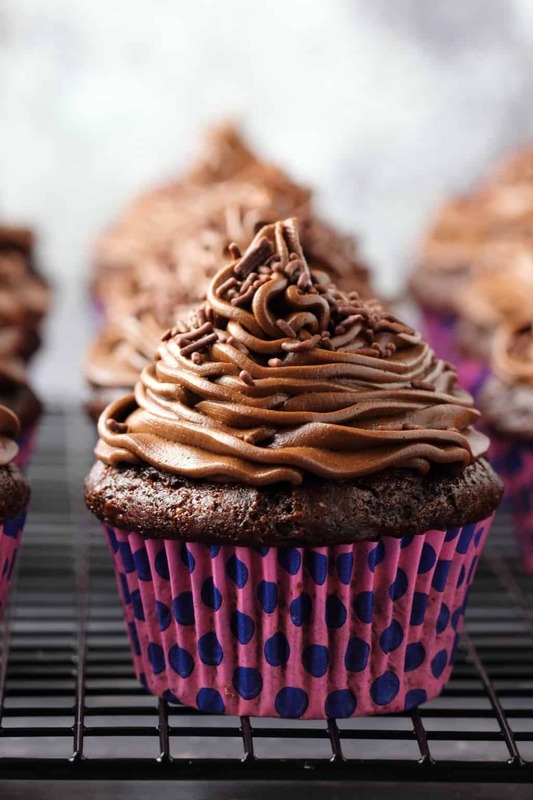 If your frosting ends up too thin, add more powdered sugar, if it’s too thick, add more non dairy milk a drop at a time until it reaches the right consistency. 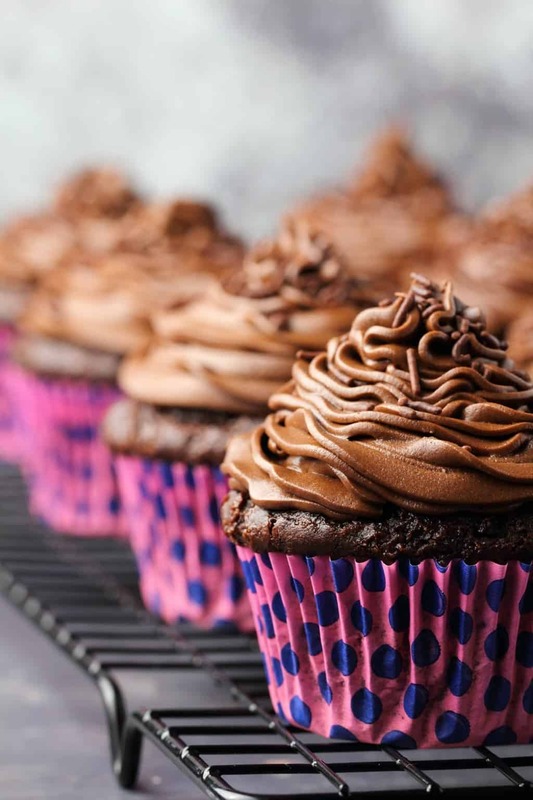 As soon as your cupcakes are cooked, move them to a cooling rack to cool completely before frosting. 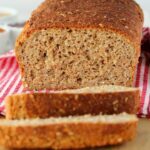 *I used Bob’s Red Mill All Purpose Baking Flour but I have tested this recipe with other gluten-free all purpose blends and they have all been perfect. Some blends have had xantham gum in them and some have not, and I have not found a difference in the outcome. As long as it is an all purpose baking blend, it should work well for this recipe. *You can use a different vegetable oil if you prefer, I like using a good quality extra virgin olive oil in baking even though it’s not the usual choice. Great recipe. So easy. Love this one and your gf vanilla cupcakes too Thankyou. Have shared your recipes and links on my Facebook gluten free and dairy free cooking page. I usedd sunflower oil stead of olive oil ( for a more neutral taste) and baking powder instead of baking soda, different quantity. My cupcakes were very dense. Should I have mixed them like a muffin mix, that is hardly any whisking? I used a stand mixer as if it was a sponge cake, was this too much do you think? Should I have barely mixed in the wet to the dry? Thanks. Hi Vicki, I definitely wouldn’t use a stand mixer to mix the cake batter, you are right, it should just be a quick whisk with a hand whisk until big lumps are gone (tiny lumps are okay). I think this would likely have caused the density, especially if everything else went as planned (flour measures were definitely correct etc). Hope they’re still tasty? 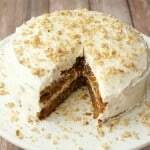 Hi, thanks for sharing your recipe is sounds like an awesome one to try. I’d like to make it soon though I don’t have a flax egg (not sure what it is) and only regular milk. Can you use an egg and reg. milk as substitutes? Hi Amy, it has never been tested with a regular egg as it was designed as a vegan recipe, the flax egg is linked in the ingredients list to a page with a video which shows you what it is and how to make it, and it’s also described in the recipe instructions. Any milk would be fine, and if you want to try it with a regular egg of course go ahead, but it has not been tested that way. All the best! Please see the comment reply above. Hi Alison, could you use an egg replacer instead of a flax egg? Thanks! Hi Celine, I have only ever tested it with a flax egg, but in theory that should be fine. I’ve made these with a regular chicken egg and they were fabulous!! They rose great, were moist and couldn’t be identified as gluten free! 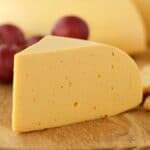 We have many g.f family members and one dairy free. They were a huge hit!!! Thanks for the recipe. I’m sharing the heck out of it!! Does the gluten free flour have to contain xanthum gum? 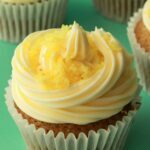 Gluten free baking is new to me and I noticed some brands contain it and others do not. Do you personally use xanthum gum in this recipe? Thank you! Hi Lauren, when I made this recipe I used Bob’s Red Mill All Purpose Baking Flour, and that particular blend does not contain xantham gum. However, in the interim I have made this recipe with other gluten-free all purpose blends that do contain it. I haven’t noticed any difference in the final result. So as long as it’s an all purpose blend especially for baking, it should be fine whether or not it has xantham gum. All the best! Do you have to use vinegar? It reacts with baking soda so it is a crucial ingredient in this recipe. You could try something like lemon juice instead. Hi Vanessa, that’s never happened to me, so my only thought would be that your oven is not calibrated correctly and is burning too hot. If you check with an oven thermometer, it will tell you what your oven really is when you think it’s 350F, then you can adjust accordingly. It’s definitely nothing to do with it being gluten-free, they should not burn at all. Getting ready to make the recipe – two questions. 1) Have you or can you double it? I need more than 12 cupcakes. From the pictures, it also looks like you almost fill the cups near to the top? 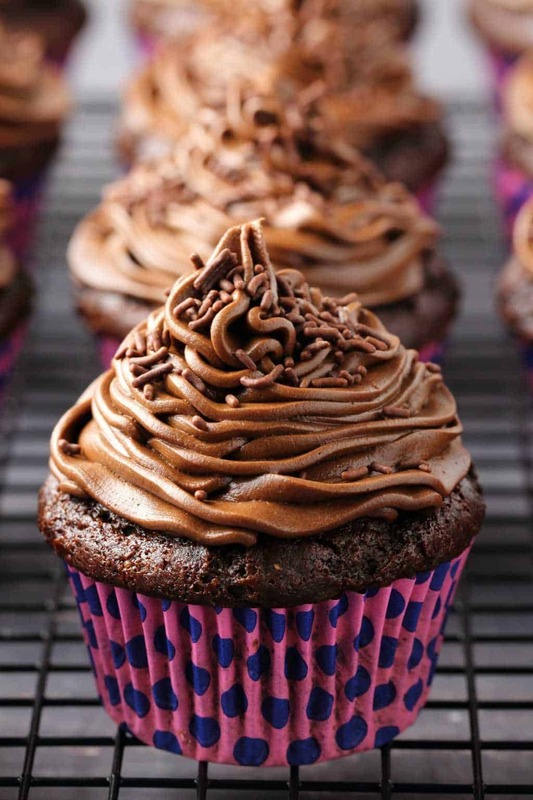 2) Will we really need a full recipe of the icing for only 12 cupcakes or did you have extra? Hi Beth, you should be able to double it without an issue, just be really careful with your calculations and it should be fine. I do fill the liners close to the top, but as you can see they come out with perfect little domes on top. I didn’t have any leftover frosting, I used all of it for these cupcakes, but as you can see it’s piped on fairly generously, I suppose you could use less if you didn’t plan on piping it like this. Great texture and crumb, but these had a milder flavor than I anticipated. I’d have preferred a deeper chocolate flavor. I needed vanilla as the icing so I just used my own recipe for the icing so I can’t vouch for that. This came out with 14 cupcakes rather than 12 for me. I’ll keep this recipe handy for future use! These were so delicious, however, mine came out a little dry and crumbled a lot when I barely picked it up. Any ideas what I did wrong? Otherwise, they were SOO good! Thanks for the recipe! Hi Monica, I would guess you might have used a little too much flour, that would cause the dryness. If you weigh it, you should have a better result with that. As far as crumbling goes though, I’m not sure what would cause that. If you used a gluten-free all purpose flour blend, as opposed to a single type of flour, it should hold together. 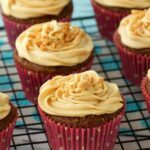 I was really nervous about making a vegan gluten free cupcake (vegan baking is especially out of my comfort zone, and when combined with GF it’s even more nerve-wracking!). This came out really great! I ended up making two batches because I wasn’t paying enough attention and assumed it was a 24 cupcake recipe. Whoops! The first batch I whisked a bit with a stand mixer and then also let sit for longer before baking. The second I hand whisked and pretty much poured straight into the tin. The first batch came out a little more dense and didn’t rise as much (which makes sense). They were a little “prettier” though in that they did not crack on the top. 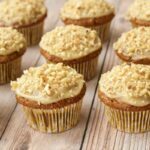 I’m really pleased that these cupcakes weren’t crumbly at all and the texture was great!. I did make one modification by letting my flax egg sit and get a little more sticky in the fridge for about ten minutes. It still seemed too runny after 1 minute. Someone mentioned they’d prefer a more chocolatey flavor. I used guittard cocoa rouge for the cupcakes (which should be a brighter, less mellow chocolate) and a dutch processed cocoa (tastes like oreos) for the frosting. I may try to push the chocolate factor in a future run of this recipe by trying other cocoa powders or subbing out some of the soy milk for some coffee.